HA Cowboy Up was the $350,000 top selling bull at the Hinman Angus 2016 bull sale. 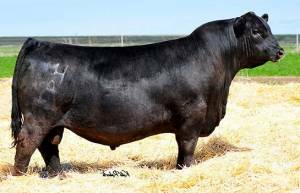 He is as wide topped, deep sided, long bodied, wide based kind of bull as you will find. He posted weaning and yearling ratios of 122 and 126 with a REA 108. His pathfinder dam as of January 2017 records 4 @ 114.